Today is my 1 year anniversary of writing this blog. Okay, that deserves a picture! Since then, I ran my half marathon in 1:44, my marathon in 4:15 and PRed a 5K in 21:48. I got hurt. I thought I hurt my achilles, but actually it ended up being a heel spur. I also jammed my hip during my marathon training and am still getting past it all. I trained for my marathon in the hot Alabama Summer. Nothing like getting up at 4:00 AM, working until 2:00, going to the Chiropractor till 4:00 and then trying to run in 100+ degree heat. I missed qualifying for Boston by 45 minutes. Still not a bad first marathon. I had wonderful participation on my blog during my marathon as I ran and my brother kept people up on my progress. TJ missed qualifying for Boston my 3 minutes – I was very proud of him. Also a year of my Lovely Wife supporting me and putting up with me being out running 1-3 hours a day!!! Thank you Lovely Wife! I honestly couldn’t do this without you! So here I am. One year to the day of starting my blog. This is my 322nd entry. Thank you to all of you who follow and encourage me on my journey. It has been a heck of a ride so far. I am not giving up on my goal of Boston. I am going to do it. I will continue until I make it and then… maybe start ultras? One year down, another on the way. This entry was posted in Boston, Boston Marathon, Diet, Half marathon, Marathon, Marathon training, Personal records, Running and tagged Boston, Boston Marathon, injury, Lovely wife, running, TJ. Bookmark the permalink. Love reading your blog, Tom!!! Happy Blog-o-versary! Thank you so much. It mean so much to me that you follow and read it!!!!!!!! I, for one, enjoy reading your posts. Keep it up! And congrats on reaching one year! Thank you!!! I really enjoy your blog too!!! Happy Blogaversary!! I do like that picture, I like the donoughts, hope they tasted wonderful! If I could send you a doughnut right now I would!! You totally deserve one! Ha. I went to Canada for vacations every year of my childhood. I love Canada. Wish I could live there. So beautiful. Congratulations! Running/training outside of a team atmosphere is incredible and in many ways much harder. I have the utmost respect and hope to be like you after my team days are over. Thank you! It is hard at times, especially since I purposely don’t listen to music when I run. When I get to run with my son or running friend, it is so much more fun. But I fear becoming obese more than hate running alone. I do hope you continue after your team days are through. I’m sure you will! Thank you so much. That means a lot to me since I feel you have one of the most encouraging and inspirational blogs out there. Let’s keep going another year! This one will be the best!!!! Congratulations, what a wonderful milestone! Here’s to many more posts! Here! Here! To us both. Thanks!!! I hope WE keep running and blogging. I really enjoy your blog!!! Happy anniversary! I’m glad your still running and blogging about it. Thanks! I’ve really enjoyed our interaction. I hope you keep on also!! Thanks Keith. I appreciate it. 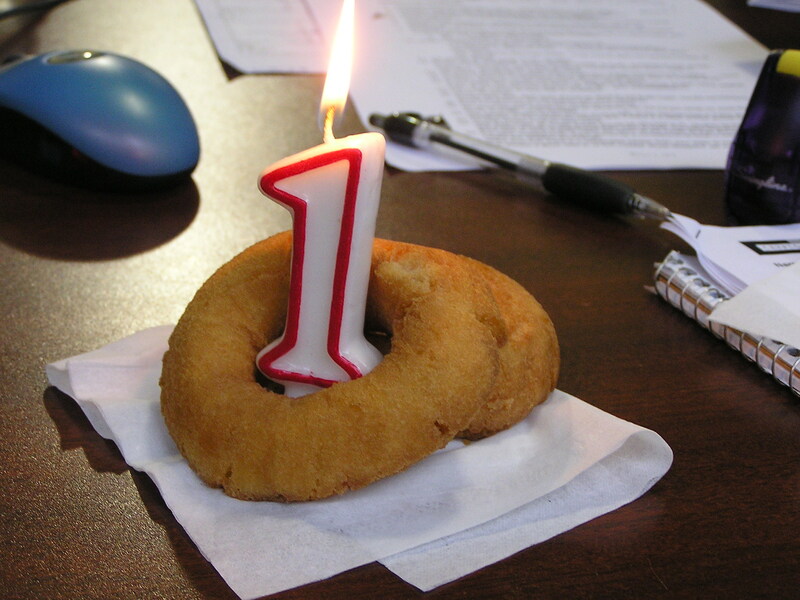 Happy Blogo-versary Tom! Hope the next year is even bigger and better for you! Thanks Bernie!!! I hope your year goes awesome also!